Have you ever considered switching out your fatty foods for something more nutritious? The problem with this is that you have no way to enjoy piping hot, crispy foods… or do you? Air fryers are designed to allow consumers to enjoy their favorite deep fried foods- without the oil. This means less fat and a healthier waistline- without the sacrifice of giving up your favorite deep fried foods. So, how does the Philips HD9220/26 AirFryer stack up against the rest? Read this review to find out. 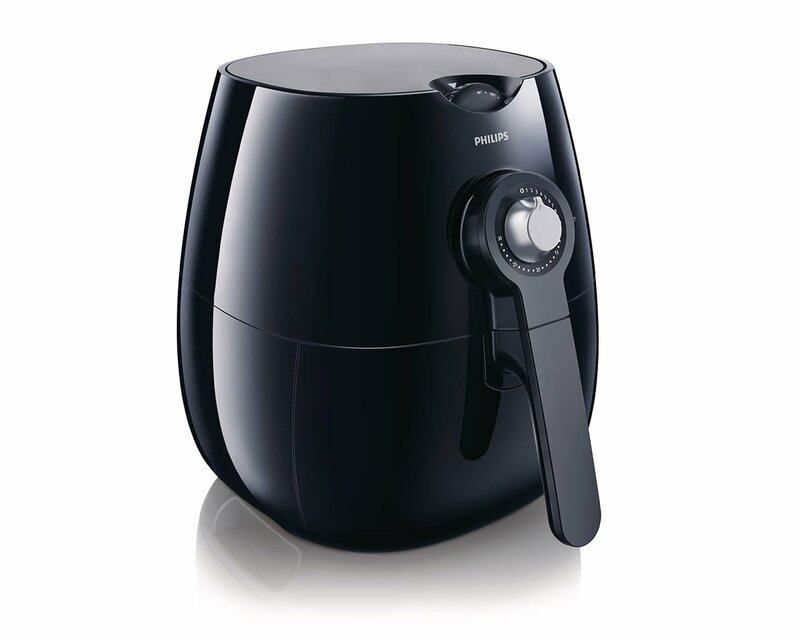 The appearance of the HD9220 AirFryer is sleek. It is black and color and blends in with the décor of most kitchens. It is also about the size of a KitchenAid Mixer, so if you have room to store it, you can do that as well. One disadvantage of the way that this air fryer is designed is that the basket is rather difficult to put back into the air fryer. This is really a problem when you are trying to make multiple batches of food and the unit is still hot as you are trying to return the basket to the air fryer. The frying basket is capable of cooking up to 1.8 pounds of food. While this sounds like a great amount, it is actually just large enough for a single serving of food for 2 people. If you are making an appetizer, such as fries or mozzarella sticks, it is large enough for about 3 people. This Philips air fryer is very simple to use. You just have to set the temperature of the appliance, place the food in the basket, pop it in the fryer, and set the timer. It is very simple to use and there are recipes available, so you don’t have to guess with all of the foods you cook. One thing to keep in mind is that this air fryer does work similarly to a convection oven. The major difference is that the air comes at the food from all sides, to provide an even crisp all around. The HD9220/26 AirFryer also works more quickly than a convection oven. An advantage of this air fryer is that it is very quiet. There is a slight noise from the fan but if there is background noise like a radio or television, you cannot hear it. The basket of this unit is top rack dishwasher safe. This is great because as long as you do not let the grease build up, it is relatively easy to clean. Unfortunately, if you do not have a dishwasher and attempt to wash the basket by hand, you may find that some sponges tear off as you scrub, leaving little bits behind. This is something you definitely do not want to find in your later meals, so be careful if you choose to use a dish sponge for cleaning. Overall, the quality of food that comes out of the air fryer is great. It is crisp on the outside and warm all the way through (provided it is cooked thoroughly). It also is crisp on all sides, which is really different from using a tray in a traditional or convection oven. The food that comes out of the Philips air fryer is delicious and can have up to 70 percent less fat, making it a lot healthier. It is especially great for frozen foods, though you can also cook fresh meats and vegetables. The fryer also allows you to grill, roast, and bake if you buy the additional trays for it. The food will taste slightly different than traditional deep fried foods, especially with all that oil missing. Some would say it tastes better, however. Some foods can be dried out by the air fryer, but you can fix this by brushing a light layer of oil on before cooking. You also should be cautions with fatty foods such a sausage or hamburger, as they may cause the oven to smoke quite a bit. The air fryer itself comes with a cookbook with about 25 recipes, which is a great place to start for cooking. You can also download an app for the Philips fryer, which offers support and guidance in providing your favorite foods. This is a great feature, as an air fryer often has different cooking times than any other method of cooking. Another cool feature is a cord storage area. This is conveniently located under the device which is great for storage and to prevent cord damage when it is not in use. At this time, the HD9220/26 AirFryer by Philips costs about $. While it is not the cheapest model on the market, it does work well for the price. It provides great tasting food. Though it has a few flaws, it still makes a great addition to your kitchen.